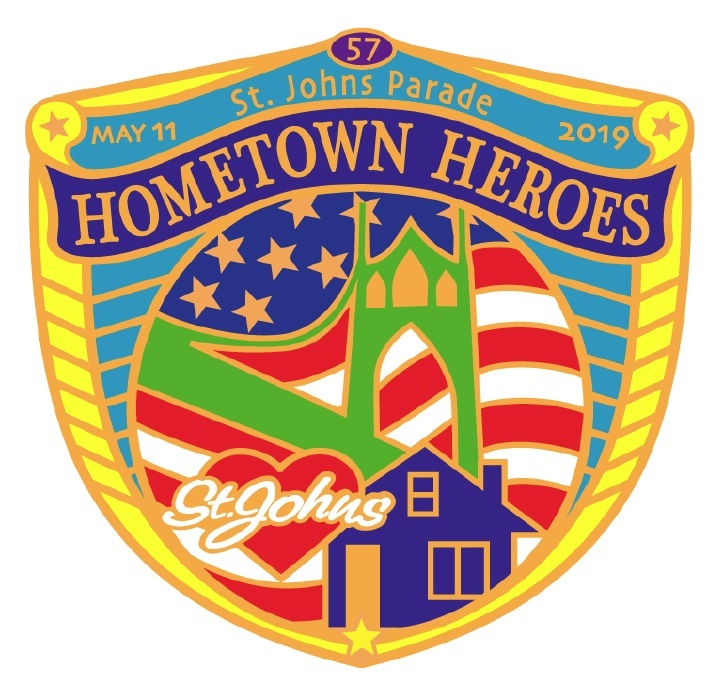 The St.Johns Parade Committee is now accepting application for the 57th Annual St. Johns Parade "Hometown Heroes". Contact Barbara Legge, Co-Chair, at Info@stjohnsparade.org or call or text 503-515-1287 with questions. Thank you for your interest. You can submit your entry online or by mail. If you mail your entry, it may take a few more days to appear on the entries list. Parade is Saturday, May 11th, 2019 at noon, rain or shine. Entry forms must be received by May 1st. 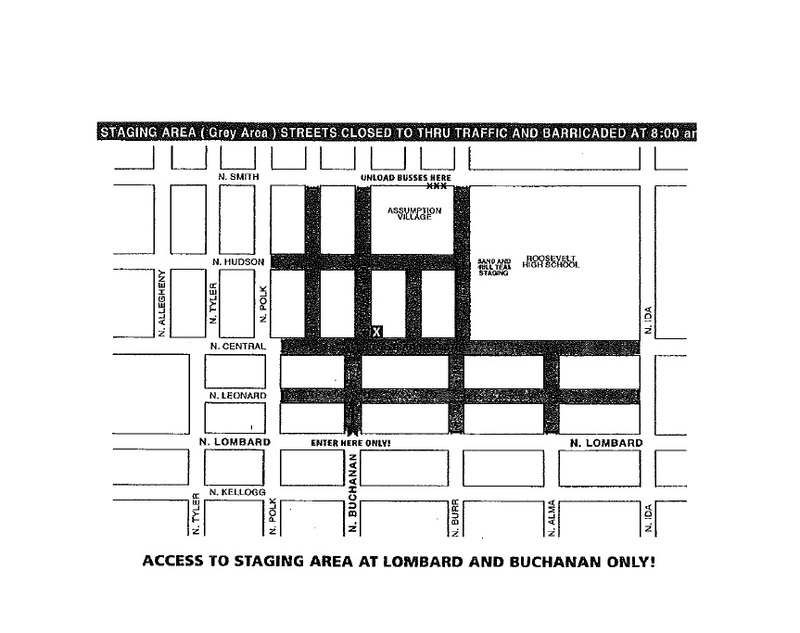 All entries with the exception of bands and equestrians MUST enter the staging area by turning off of N. Lombard on to N. Buchanan, and then proceeding to the Check In Booth on the corner of N. Buchanan and N. Central (see map). There you will be given a packet with your entry number and judging form. The Volunteer at the Check In Booth will direct you to your staging area. Bands and Equestrians: If you have any questions about how to enter the staging area, please contact a parade Volunteer at info@stjohnsparade.org. Buses: Travel west on N. Lombard to N. St. Louis. Turn right and go to N. Smith and turn right again. Drop parade participants off in front of Assumption Village Retirement Home, on the corner of N. Smith and N. Burr, across Burr from the Roosevelt High School football field. After dropping off participants, proceed straight ahead on N. Smith to N. Ida and turn right. Go to N. Lombard and turn right again. Travel to N. St. Louis, turn right, and go to N. Central and turn right. At the far corner of the Community Center park is N. John. Turn left and pull up as far as possible to park your bus. The parade disbands at the St. Johns Community Center. If you are a vehicle group or if your group has more than one car/truck/float in your entry, you MUST get together as a group outside the staging area and come in as a group to the Registration Table. Once any of you have entered the staging area, it will be impossible to get the rest of your group staged together if you don’t enter at the same time. Equestrian entries: you must keep your horses under control at all times and provide your own clean up scooper. Also, riders under 18 years of age must have a walker with them at all times during staging and on the parade route. Equestrian Judging starts at 10:00 am. Other animals, including pets, are not allowed in the parade without prior approval. All children participating, including those accompanied by their parents in the entry, must have a signed Permission Slip with them on parade day for each child under 18 years of age, or thru 20 years of age, if he/she is still living with/insured by parents or legal guardian. Please view and print and complete the Permission Slip as needed. The permission slip must have emergency contact information and must be signed by the parent or legal guardian of the child, giving the child permission to participate in the parade. Children must be supervised at all times. If participants are on a vehicle or flat bed truck they will not be allowed to get on and off the vehicle during staging or on the parade route. Once on, stay on. Again, this is for the safety of all participants and spectators. No candy, treats, flyers, or other items may be tossed, dropped, rolled or handed out by walkers or riders, or from floats or vehicles. Adequate spacing between entries allows for safety, and for spectators to appreciate each entry. If the space between you and the entry ahead of you becomes less than a car length, pause long enough to increase the space to one car length before continuing. Please follow the instructions of any parade security volunteers or police officers. Please do not attempt to drive down streets that have been barricaded. Please tell the other people in your group not to attempt to drive down streets that have been barricaded. We Can't Emphasize More: THIS IS FOR THE SAFETY OF OUR CHILDREN! ( 1st * 2nd * 3rd ) Place and Honorable Mention Ribbons will be awarded. Bands: Uniform/Costume/Dress, Discipline/Skill/Precision, Marching ability, Musical ability, Overall appeal. Equestrians: Appearance, Uniform/Costume/Dress, Discipline/Skill/Precision, Overall appeal. Vehicles: Appearance, Mechanical, Originality, Overall appeal. All other categories: Appearance, Artistry/Creativity, Originality, Parade Theme, Overall appeal. The parade starts promptly at 12 noon. Entry # must be displayed prominently (on the left of the entry) at all times and vehicles must be attended at all times. Download the Official Entry Packet to have this map on hand when you check in. 1. Complete the form below to make your entry. 2. Click the Preview button below and scroll down the page to review your entry. 3. If you are satisfied, please print this entry from your web browser. 4. After you have printed your entry information, you will then click Submit to send your entry. 5. When your entry is received, you will see your Entry name listed on the Entries. Important: YOU DO NOT NEED TO MAIL IN YOUR APPLICATION IF YOU PLACED YOUR ENTRY ON LINE! Bring one copy with you to the Check-In Booth on N. Buchanan on parade day. You will then be given an entry number for judging and be directed to the staging area. * The Check In Booth will be open from 8:30 am until II :00 am. If you have not checked in by 10:30 am, you may not be judged. * Your entry form must be received or postmarked by Tuesday, May 1, 2019. No entries will be accepted after that date. Submission by mail If you would like to submit your entry via US Mail, you may download an Official Entry Packet. Please download and print this PDF form and complete in its entirety. IMPORTANT: Do not submit your entry online if you plan to send your entry by mail. (This will just confuse us!) Send the original completed paper form and one copy to the address on the form and bring one copy with you to the Check-In Booth on N. Buchanan on parade day. You will then be given an entry number for judging and be directed to the staging area. BE SURE TO SIGN THE ENTRY FORM BEFORE MAILING! Your entry name will appear on the Entries page. The Parade Committee requests your support in maintaining a Family Appropriate Venue. Use Title Case such as in St. Johns Parade. Capitalize the first letter of each word. Your entry will be listed exactly as you enter it here. 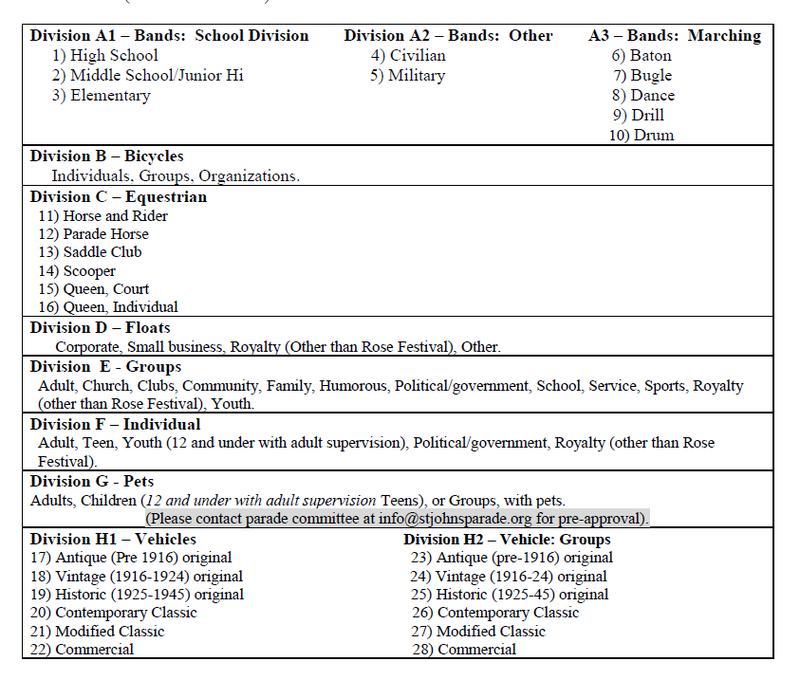 Refer to the Division and Judging section above to confirm and select your division. I, the undersigned, as an Individual, or Group Representative, hereby remise and forever discharge the St. Johns Parade Committee, its officers and directors, severally or jointly, and all volunteers, of and from any and all liability, claims, actions, and possible causes of action which may accrue to me or any member of the group from every and any loss, damage, and injury (including death), that may be sustained while participating in the parade. Further, I have read the General Information and the Safety Information and agree to abide by all policies and rules of the St. Johns Parade. If I am not on site on parade day, I agree to make sure that a responsible adult represents my group and is informed of all policies and rules. I have read the General Information above. I have read the Safety Information above. Parents have prepared a signed Permission Slip for each child under 18 years of age, or thru 20 years of age, if he/she is still living with/insured by parents or legal guardian. Not Required. No children marching with this entry. Type your full name to confirm. This is a binding electronic signature.